← Not enough flies? How can that be a bad thing? A well-attended meeting in Newstead last Tuesday was told that Vicroads’ Pyrenees Highway tree removal and wire rope barrier project was about to proceed. The meeting was therefore a briefing, not a consultation: it was not going to change anything essential. Engineers were put through the wringer by resident questions, but there was an air of fatality about the proceedings. 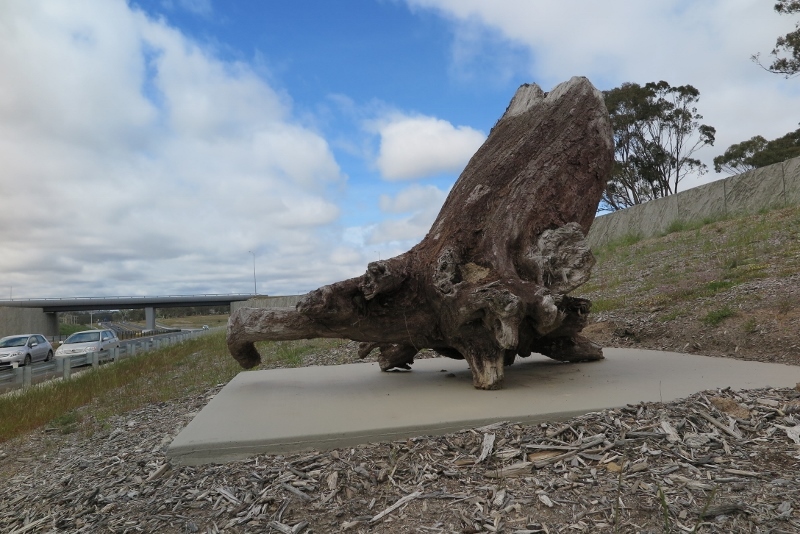 Strange monument at the Ravensood interchange, Calder Freeway: is this a symbol of the relationship between human beings and the environment? Nearly 2000 trees, many of them ancient,were destroyed for this project. It will take several hundred years for the ‘offsets’ planted to replace them to come anywhere their size. Although Vicroads has made some compromise on its original proposals of two years ago, its project is essentially the same. Questioned about the ultimate rationale behind it, engineers cited ‘modelling’. This modelling was unexplained, but– it is claimed–it shows that reducing the speed limit on the highway would have some beneficial effect, but wire ropes and tree removal would have more. Against a background of repeated campaigns to persuade us that ‘speed kills’ and that we should ‘wipe off 5’, this claim was greeted with scepticism by your FOBIF correspondent. Engineers were also quizzed about the actual rationale behind the project, justified by accident statistics involving one fatality not related to the road condition. They were unclear in their responses to these questions, arguing that their role is implementation, not the justification of the project. There has been some confusion about this project over the years. For example, we were told two years ago that rumble strips had been removed from the project for cost reasons. Last Tuesday, however, we were assured that they are well and truly in it, though it’s not clear whether centre of the road plugs will be installed. And it seems possible that a speed limit reduction will be ‘considered’. All this is against a background of far more serious Vicroads atrocities around the state, especially on the Calder at Ravenswood and the Western Highway west of Beaufort. No one disputes the need for safer roads: but it seems that in pursuit of this end environmental concerns are froth to be run over by the bulldozer. We assume that authorities would not demolish Saint Paul’s Cathedral to improve safety in the Melbourne CBD; they don’t have too much trouble obliterating thousands of trees, many of them hundreds of years old, in pursuit of the same end. Vicroads has undertaken to run a further ‘consultation’ soon. It’s fair to say that the Vicroads personnel at these meetings are unfailingly professional and courteous. The problem seems to lie deeper: that in any consideration of land management (water, fire, roads…) the environment comes off second best. That chicken has still to come home to roost. I’m feeling flummoxed, thwarted and rather pissed off by this process of being told “what is going to happen” under the guise of “consultation” … I personally do not see the need for any changes, but would find it quite acceptable to continue the 90km limit out to the Muckleford Creek bridge (which they will widen in due course?!). As I tried to explain at the meeting, we are all licensed to drive – under all conditions – and we do so responsibly on a minute by minute, hourly, daily or seasonal basis according to road, traffic, weather and diurnal light conditions. And when we approach oncoming vehicles we pass within a metre of them at varying aggregate highway speeds from 180 up to 220kmh. So I ask, with our modern highways – 2 lanes each way, no sharp bends or steep gradients – is “safety” the real reason why so many $Millions are being spent on wire strainers and metal bouncing barriers ?? Or is it simply a political spaghetti junction of major Party rivalries clashing with Bureaucratic Empires and their principals striving to develope their CVs? Living in this thoughtful Newstead Community, the idea which satisfies me most would be to take these issues out of their hands by electing our own Community Independent Representatives in Local, State and Federal elections. Shall we get started? I began to watch tonight’s re-run episode of UTOPIA … and got some prickly skin thinking about our VicRoads meeting – had to turn it off! Works are scheduled to start almost immediately it seems – perhaps 29/1! A petition with 500 signatures will be presented to Maree Edwards tomorrow thanks to the efforts of some dedicated locals.